Looking for sentimental gift to give to your parents on your wedding day? 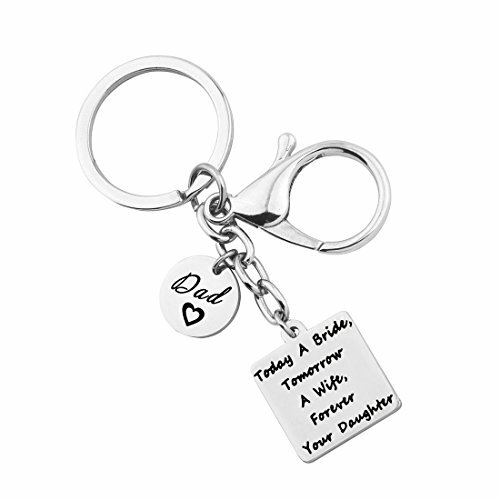 This bracelet and keychain includes a stainless steel laser engraved charm with "Today a bride/groom, tomorrow a wife/husband, forever your daughter/son" on it. The mother in law bracelet is also made of stainless steel and expands to fit over your hand easily and returns to its shape after put on or taken off. It is a unique and affordable way to express your sentiments whether for yourself or someone special. Material: Stainless steel, it is lead free and nickel free.Stainless Steel is affordable, incredibly durable, and it will not rust or tarnish and is hypoallergenic. Measure: square charm of mother bracelet: 1.8cm (0.71inch) * 1.8cm (0.71inch), square charm of father keychain: 2cm (0.79inch) * 2cm (0.79inch),mom heart charm:1.8cm (0.71inch) * 1.5cm (0.59inch), dad disc charm: 1.5cm (0.59inch), pearl bead: 0.8cm (0.31inch) diameter, bangle diameter: 6.5cm (2.56inch). Each mother bracelet or father keychain individually packaged in a velvet bag, ready for gift giving! It would be such a sentimental keepsake gift for your mom and dad. "Today a bride/groom, tomorrow a wife/husband, forever your daughter/son"- a wonderful gift to tell your mother/father that no matter what she/he will always be loved. An inspirational quote bracelet/keychain makes a great wedding keepsake memento. As we all know that Wedding is an important event of our life not only for the couple getting married but for their families as well. This also is a sweet way to welcome your new mother/father in law into your family and show her how much you appreciate her for raising your other half so well.